Here is a salad recipe packed with flavor! It has protein from the chicken and cheese, healthy fats from the avocado, and vitamins, minerals, and antioxidants from all the fresh veggies. This is a great summery dish that can stand alone. Recipe and further detail provided by Café Delites. Heat about one teaspoon of oil in a large grill pan or skillet over medium-high heat and grill or sear chicken fillets on each side until golden, crispy and cooked through. Once chicken is cooked, set aside and allow to rest. 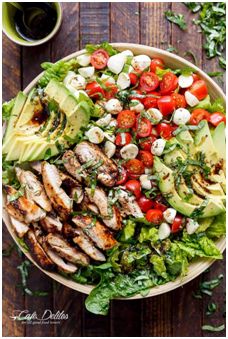 Slice chicken into strips and prepare salad with lettuce, avocado slices, tomatoes, mozzarella cheese and chicken. Top with basil strips; drizzle with the remaining dressing; season with salt and pepper; serve.